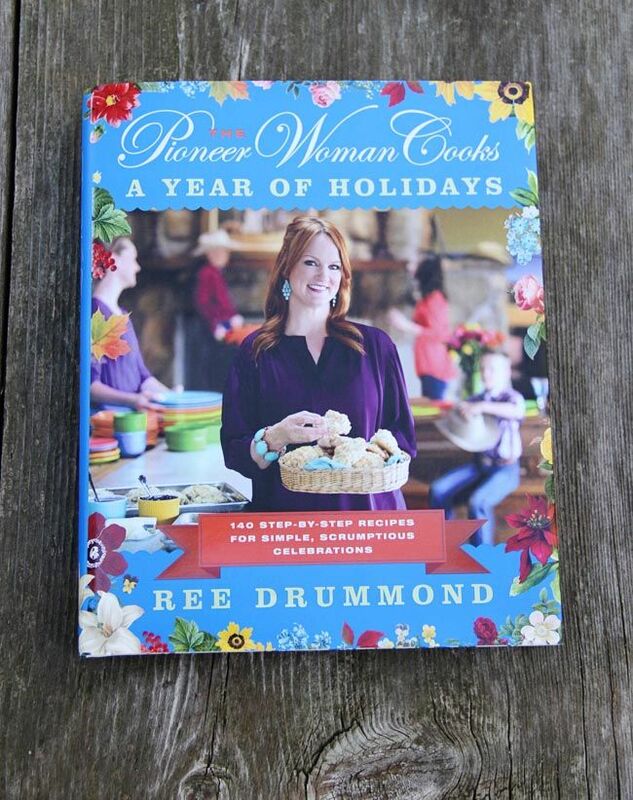 Ree was so sweet recently to send me a copy of her new cookbook, A Year of Holidays. It is amazing!! 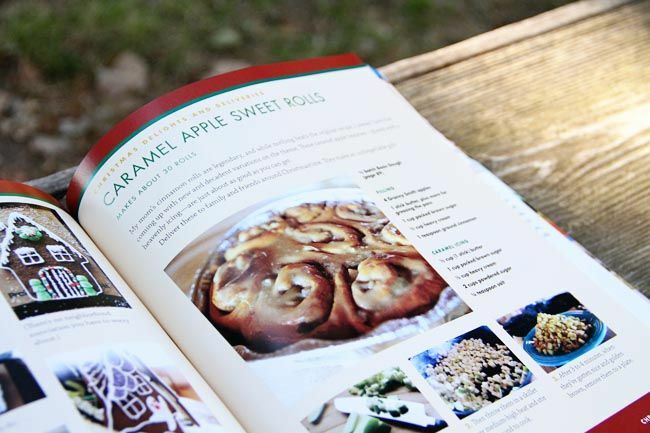 It is one of the most beautiful cookbooks I think I've ever seen. Seriously. I have loved all of her cookbooks, but this one is just on a whole new level. It will be loved and used for years and years. It covers every possible holiday and is full of tips for timing and making your meal planning easier. Barn Kitty jumped up while I was trying to snap photos. Lilo just wanted the food on the pages to come to reality so she could eat it all. 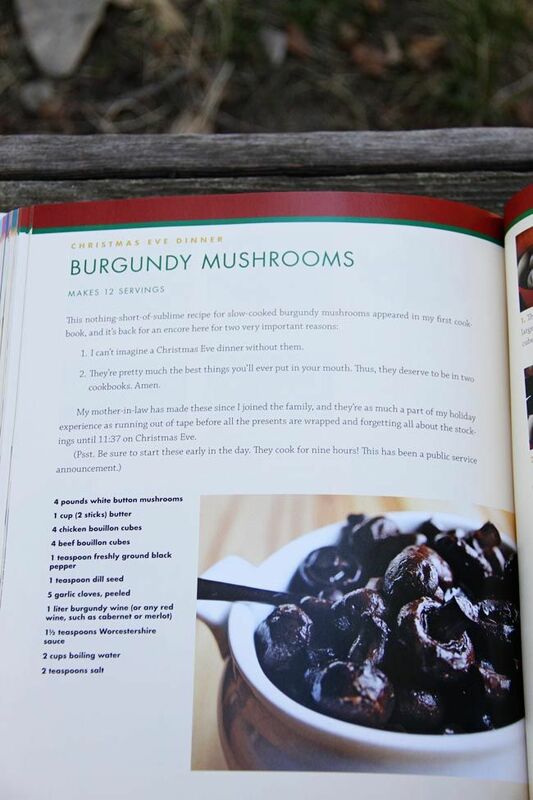 For Christmas I just want a big bowl of Burgundy Mushrooms. No meat required. Just shrooms. And maybe a side of guacamole. Because there's never enough guac in my life. Ever. And I'll finish with Caramel Apple Sweet Rolls. Because they have fruit in them, and I'm all about having a healthy balanced diet. And guess what? 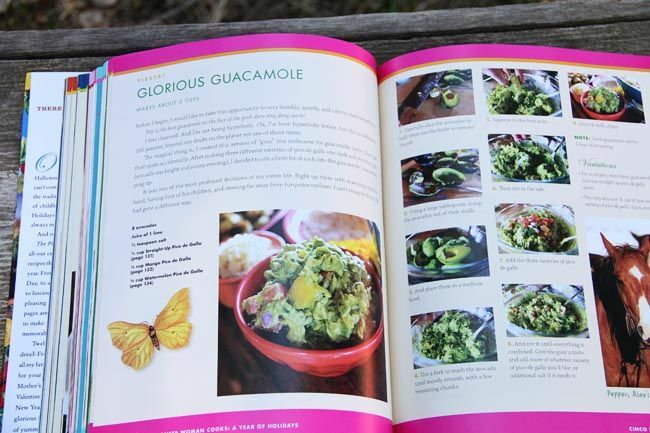 Ree has agreed to sign a cookbook and ship it straight to you! So you can win a signed cookbook from The Pioneer Woman and a custom ornament from The Rusted Chain!! To enter: Leave a comment on this blog answering "What is your favorite Christmas food?" We'll draw a random winner this Friday. Peppermint fudge. That counts as Christmas food, right? Okay. Standing Rib Roast! Christmas is the only time we have this and it is so yummy! Eggnog, although that is a drink and not food. Hope it still counts :-))) Our family LOVES watching the Pioneer Woman on Saturdays. My 7 year old recently suggested that Ree could come live with us and do all the cooking, I would be in charge of cleaning. Apparently, my cooking isn't up to par which means I NEED this cookbook! L0L! If my name is drawn she really needs to sign the book to my boys, they would be thrilled!! Egg nog. And ham. And all the yummy potluck desserts people make... I can't pick just one! My favorite foo that we cook every year for Christmas is Monkey Bread and Red Velvet Cake! Stuffing my mom-in-law makes. It's ssssoooo good!! Favorite Holiday Food - Oh, the soft ginger cookies, I love the tastes of the season! My Mom's fudge...she's beem gone 14 years and I still miss her. And I still can't make the fudge taste like she did. Roasted marshmallows from our fireplace. I love Sugar Cream Pie, an Indiana favorite. Its a blast back to my childhood when my brother and I would fight for the last slice. a recipe my mom had, and we only eat at Christmas. Its called "cinnamon candy apples". You dice apples (you can even use canned, drained) and pour into whatever size casserole dish, Pour some red hot cinnamon candies over them, let set for an hr. and then bake at 375 until bubbly and apples are done. Its so good, and reminds me of my mom, who has passed. Idk that i can pick just one Christmas food. I love cornbread dressing, fudge, and pumpkin pie. I love all the cookies! My favorite is a chocolate Andies Mint cookie! My favorite Christmas food is cookies. Any kind will do, but particularly ginger snaps and snickerdoodles. And I think pumpkin pie is still considered Christmas food although it's also Thanksgiving food. Mmm... favorite Christmas food? I can't narrow it down. My mom's divinity, mother-in-law's stuffing, dad's glazed ham, grandma's fudge, great-grandma's scalloped carrots. Yum! Eggnog cookies are coming! Yay! Xmas baking is my favorite! Fudge, pumpkin muffins, stain glassed cookies...I can go on and on! I love love love Sand Tart cookies, which is a recipe that has been in our family for 4 generations or more. We make them only at Christmas. I pinned it at http://www.pinterest.com/pin/29203097557551846/. Pinned the pretty ornaments on Pinterest! I also facebooked it at https://www.facebook.com/melodeebeth?ref=name. Baklava is my favorite thing to make. I have no family connection just love the stuff. Ree's cinnamon rolls have become a tradition for Christmas as my house and they are my absolute favorite!!!! My favorite Christmas food is...All of it, favorite time of the year. Ham and mashed potatoes! Chocolate chip cookies and rice Krispy treats! Yum yum! all the mashed potatoes and gravy I want, that I won't let myself eat the rest of the year. Fudge, for sure! What a great giveaway! I'd love to find some new family traditional foods. I love a fried turkey..
My moms sweet potato casserole. Favorite Christmas food: Gingerbread!! Though the broccoli casserole we only have at Christmas is a close 2nd! I pinned your awesome ornament photo! my fave foods during the holiday season are my Grandmother's Pecan Pie and Peanut Butter Fudge!! Fried corn. My daughter who is 5 helps me put all the ingredients in the crock pot and stir. Cooking with her is my favorite thing. Spaghetti and shrimp. We have a traditional Italian meal every Christmas Eve, so nothing makes me think of Christmas more than noodles and shrimp! Homemade divinity! My grandmother's recipe. And I've been following Ree Drummond since BEFORE she went viral ... what an amazing and funny lady, with cooking talent to boot. 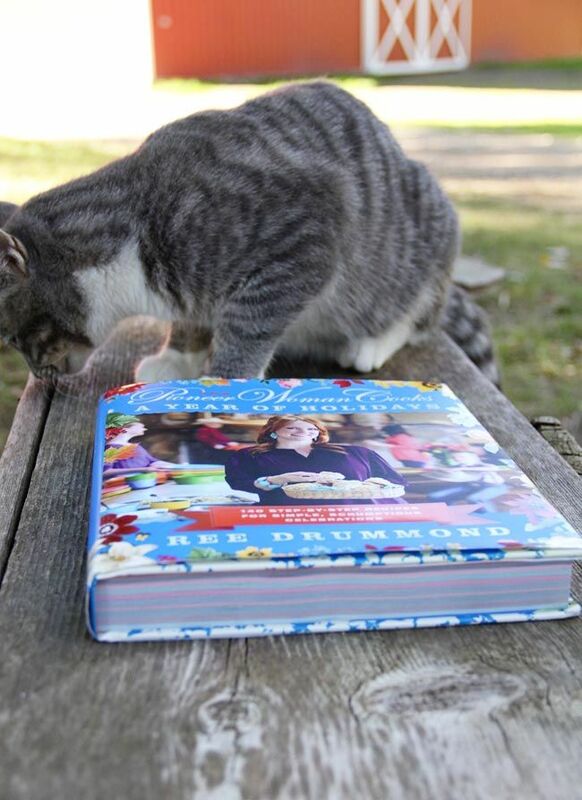 I have both of her first 2 cookbooks and am looking forward to her new endeavor as well. And The Rusted Chain??!! LOVE you guys! Thanks for a chance at an amazing prize giveaway event! Pumpkin pie! We have it for Thanksgiving AND Christmas. Panettone - only have it at Christmas and I love love love it!! It's a toss up between eggnog and Christmas cookies...hey, how about eggnog WITH Christmas cookies, yeah that the ticket! My Great-Grandma Selah's homemade Apple Cobbler! It has been passed down for generations, and I can't wait to teach my little ones how to make it, too! Cream cheese mixed with cranberries on a ritz cracker... I can't stop eating them... sigh. Eggnog and homemade peanut clusters. Do those count? Just posted in on the Silver Shoes & Rabbit Holes Facebook page! Shared on Facebook as well as pintrest! My favorite Christmas food are my mother-in-law's snicker cookies!!! She only makes them once a year so they're quite a treat!! Peppernuts, it's the only time of year I make them, delish! My mom's homemade dressing. I have tried and can't make it like she does! My favorite food during Christmas has to be green bean casserole :) Love it! My MawMaw's peanut butter fudge or sweet potato casserole or homemade "trash" aka chex mix or ... the list could do on and on. I can't pick just one favorite! My favorite Christmas food is my Grandma's butter ring cookies. I could (and possibly have) eaten the entire jar. 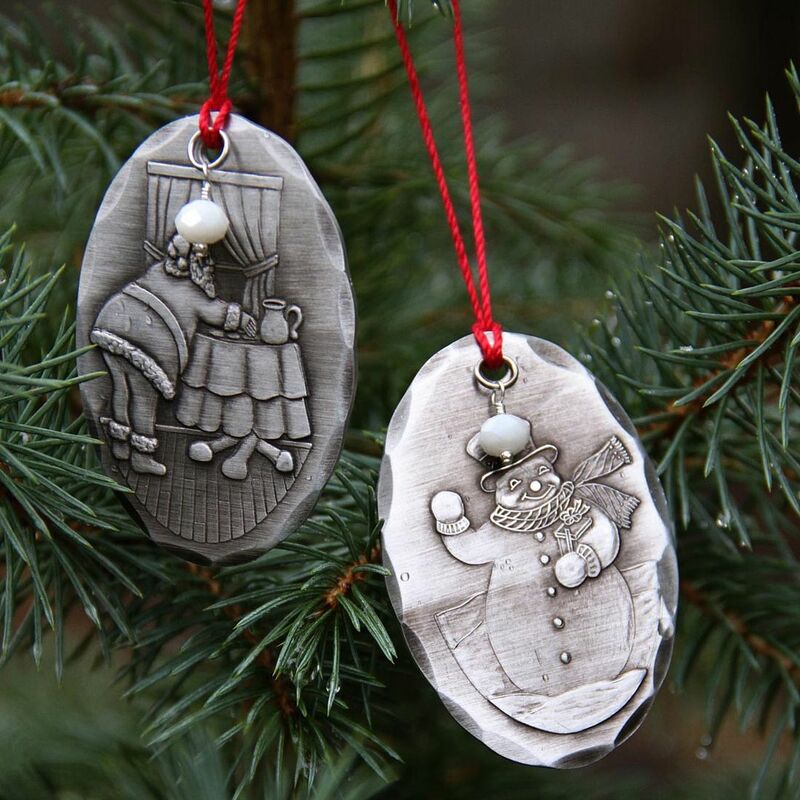 I pinned your beautiful ornaments! My favorite Christmas food is the Pierogi's my Grandma used to make us! Oh me, oh my...I must only pick one? Alright if I must, sweet potatoes. But there is also pie and ham and stuffing and green beans with loads of bacon and and and. My favorite Christmas food is pie!!! Mom's Mini HaHas. Every winter, about early December Mom would get us to start cracking and peeling pecans. Then she would start her shopping for all the dried fruits and a 1/5 of JD. Mini HaHas are a cookie that is much like fruit cake with a meringue that has a pecan half all baked on top. So basically you bake the fruit cake style cookie. Then make fresh meringue. When the cookies have cooled you dollop the meringue on top, stick a pecan half in and pop them back into the oven for the pecan and meringue to toast. Mom is in her 80s now and not in the best of health. We don't get Mini HaHas anymore. Maybe I should start making them for my grandsons. Hmmmm.... I watch The pioneer Woman every Saturday. I've seen ads for this cookbook. I'd love to own a signed copy!!! It would just make my day, week, month, year! Love honey baked ham and roasted vegetables! Honestly, love the smells created by the food cooking more than the good itself! Bubble loaf on Christmas morning! Well I love all the Christmas food that is made like Ham, turkey (im a meat kind of girl) but then I love all the sweets, peanut butter balls, choc eclair!! My hubby and I make the bestest ever..white chocolate reeses peanut butter fudge...a must during the holiday...Would love, love, this recipe book..and either of the ornaments from The Rusted Chain....Thanks for this give away...Blessings! My favorite Christmas food is frosted sugar cookies! I can't get enough of 'em! Pinned your ornaments to my Christmas boards....Blessings! Shared on Facebook as Cat Zamarron.Rychlinski. Pinned as KittyCatRollerMoM on Pinterest. My favorite food is rutabagas as the only time I make them are the holidays! Caramel covered marshmallows rolled in toasted coconut, courtesy of my stepgrandma. She knows how to make my Christmas bright! Just shared your post on Facebook!! Not exactly a food, but I could totally live off of eggnog. Does it get more amazing? Ricotta cheese cookies with anise frosting are my favorite. Fudge and my family's Croatian recipes for Christmas Eve. Sugar cookies with frosting :) I love making them almost as much as I love eating them! Spritz cookies. YUM! Just can't stop eating them! Homemade mashed potatoes made by my mom-in-law! Cannolis!!!! Yummo Beki especially from an Italian bakery! Woot! It is so hard to pick just one favorite Christmas food!! There are so many - guess it will have to be pecan pie because that's the only time of year I eat it. Yum!!! Peppernuts! Love the smell of them baking....and they taste yummy too! My grandfather's cookies are what I look forward to and definitely my favorite Christmas food. Peppernuts and bubble bread, which are both Christmas traditions at our house! Peppermint bark. And my Dad's cashew brittle, but he has been gone for 7 years and no one else can make it. 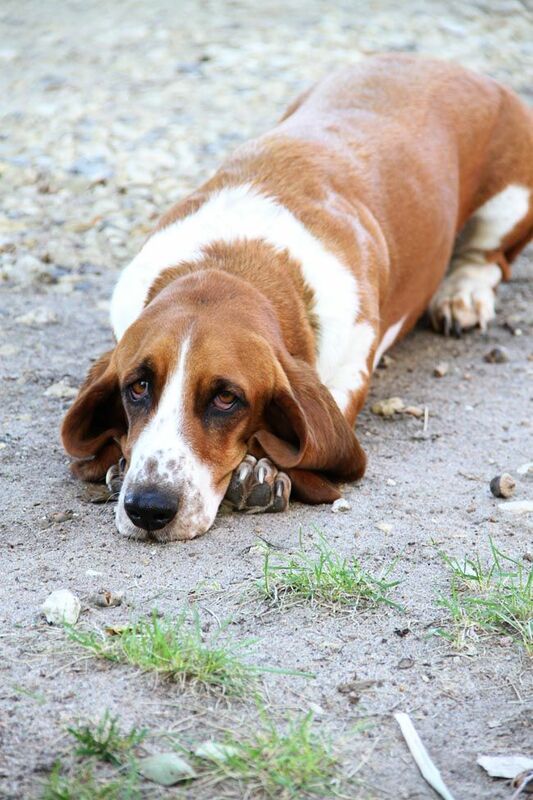 Sad face, wish I could make it like he did. We always have lamb for our Christmas dinner...YUMMM! Date-Nut bread! My grandmas recipe. Wouldn't be Christmas without it! My great grandmothers cinnamon rolls!! Thank you! ps I adore your new barn and love the pictures you took at night of it! Happy Wed! My favorite food - cut out sugar cookies with buttercream frosting. The recipes belong to my grandmother. Love the memories that I have made/will make with my 4 children making these cookies. And the messes! Gingerbread cookies -- and eggnog! I love gingerbread cookies and houses!